This terrific piece of Bremeniana just came up for auction on eBay: a Joseph P Leitch Company cigar box from about 1900. It features a fantastic photo of one of the Bremen bands of the time, and the back is designed to look like a book and tuck discreetly into your bookshelf where small (or teenage) hands wouldn’t find your cigars. The History Center has two similar boxes in its collection. Click an image to start a slide show. Plymouth (vertical) & Center (horizontal) in 1898. North is to the left. 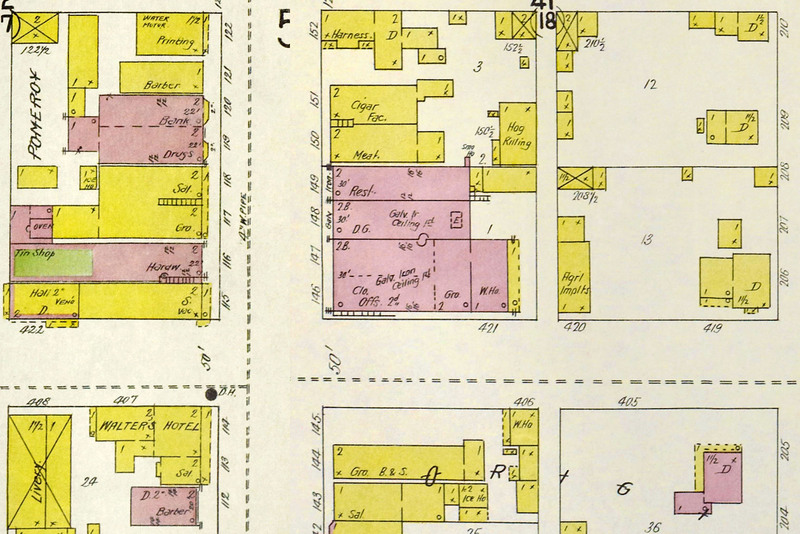 In 1901, Joe Leitch was successful enough to build a new brick building which was occupied and later sold to Moe Lowenstine, whose clothing store was a staple in Bremen for many years afterward. Mr. Leitch traveled to Cuba from time to time, where he had land holdings, and came back with many interesting stories. The Leitches left Bremen about 1907 for Blackstone, Virginia, where Joe made a good deal for a new cigar factory but ultimately resettled in Tahlequah, Oklahoma. The building Joe Leitch built and sold to Moe Lowenstine remains today the central section of the south side of the 100 block of E Plymouth. There are two of these boxes at the Bremen History Center.